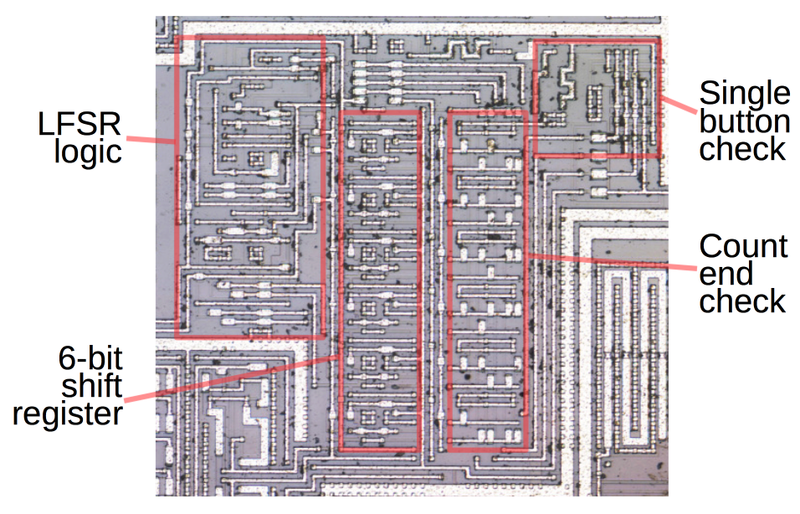 A die photo of a vintage 64-bit TTL RAM chip came up on Twitter recently, but the more I examined the photo the more puzzled I became. The chip didn't look at all like a RAM chip or even a TTL chip, and in fact appeared partially analog. By studying the chip's circuitry closely, I discovered that this RAM chip was counterfeit and had an entirely different die inside. In this article, I explain how I analyzed the die photos and figured out what it really was. The die photo above is part of Project 54/74, an ambitious project to take die photos of every chip in the popular 7400 series of TTL chips (and the military-grade 5400 versions). The 74LS189 was an early RAM chip (1976) that held just 64 bits: sixteen 4-bit words. This photo interested me because I had recently written about Intel's first product, the 64-bit 3101 memory chip (1969). In my photo below of the 3101, you can see the 16 rows and 4 columns of memory cells forming a regular pattern that takes up most of the chip. The 74LS189 was an improved version of the 3101 RAM chip, so the two die photos should have been very similar. But the two photos were entirely different and the 74LS189 die didn't have 64 of anything. This just didn't make sense. A closer examination of the chip brought more confusion. I usually start analyzing a chip by figuring out which of the pins are power, inputs, and outputs, and cross-referencing with the datasheet to find the function of each pin. The power and ground pins are easy to spot, since these are connected to thick metal traces that feed every part of the chip. 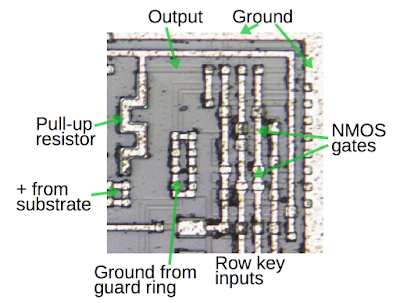 Most 7400-series chips have the power and ground on diagonally-opposite corners of the chip.1 The die photo, however, shows the power and ground separated by just 5 positions. This immediately rules out the possibility that the chip is the advertised 74LS189, and makes it unlikely to be a 7400-series chip at all. In addition, the transistors all looked wrong. A chip in the 74LSxx series is built from bipolar transistors, which are fairly large and have a distinctive appearance. 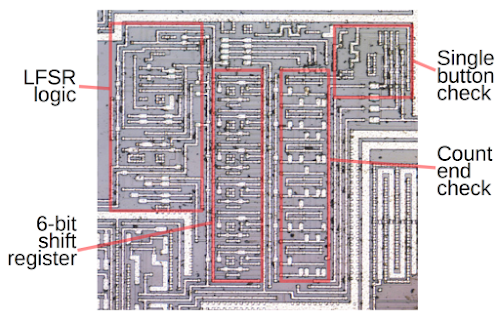 The transistors in the die photo looked like much smaller and simpler CMOS transistors. 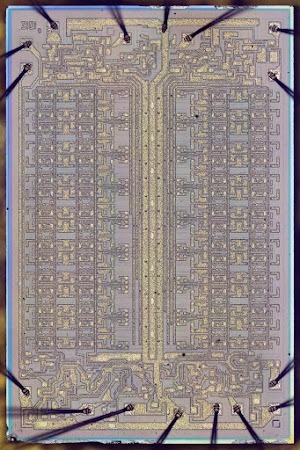 Some visible features on the die of the alleged 74LS189 chip. These features don't match a RAM chip. The chip also contained a complex resistor network, not the simple resistors you'd expect on a TTL chip. The resistor network (along with the large, complex transistors next to it) led me to suspect that this chip had analog circuitry as well as digital logic. I thought it might be an analog-to-digital converter (ADC), but after looking at some ADC datasheets, I decided that wasn't the case. The chip had way too many inputs, for one thing. The first big clue was when I studied the resistor network carefully. In the photo below, I've marked the resistors with light or dark blue lines. They are all exactly the same length, giving them the same resistance (R). Some were connected as pairs to get a resistance of exactly 2R. I noticed they were connected in a pattern of R-2R-R-2R-... which forms a R-2R resistor ladder network. This structure is used for digital to analog conversion (DAC): you feed bits into the network and you get out a voltage corresponding to the value. 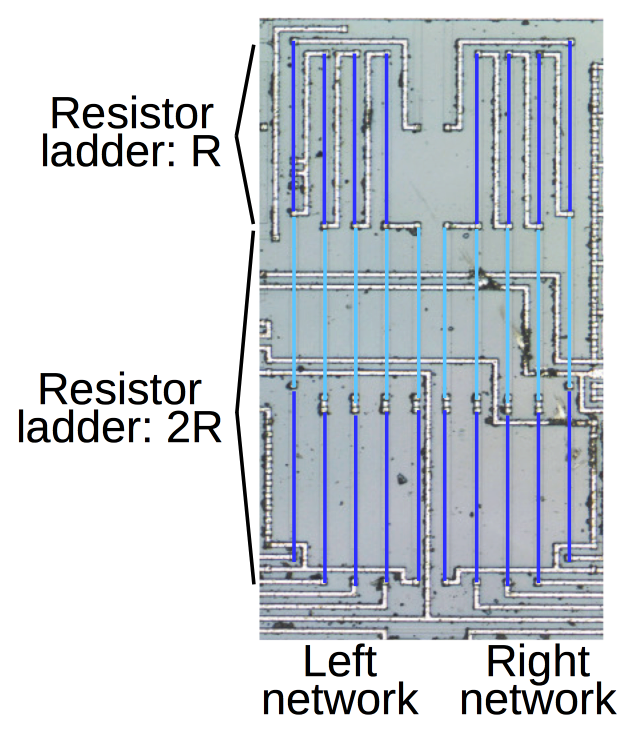 The chip had two of these ladders, forming two 4-bit digital-to-analog converters. 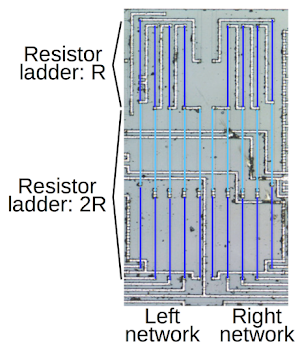 The resistors in the center of the die forms two R-2R ladders, which are simple digital-to-analog converters. What values were going into the digital-to-analog converters? The middle of the die photo contained two small matrices, which I recognized as ROMs, each holding about 24 four-bit words. Perhaps the values in the ROMs were being fed to the DAC. Each row of the ROM had one section (on the right below) to decode 5 address bits, and a second section (on the left) to output the associated 4 data bits. Each data row has a transistor for 1 or no transistor for 0. The decoder is arranged in pairs with one transistor present out of each pair, either matching a 0 address or matching a 1 address. Thus, by looking at the chip, we can read the values in the ROMs. Detail of a ROM in the chip. Each row stores four bits of data. The pattern of square metal contacts shows the data bits. 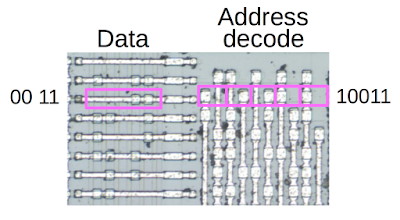 On the right, the address decode circuit matches the address for the row. Normally a ROM has sequential rows, so you can see the decoder counting in binary, but this decoder was different. Addresses in the ROM were arranged as 10011, 11001, 01100, ... Each address was generated by shifting the previous one to the right and adding a new bit on the left. E.g. 10011 -> 11001. This suggested the ROM addresses were generated by a linear-feedback shift register (LFSR) rather than a binary counter. The motivation is a shift register takes up less space than a counter on the chip; if you don't need the counter to count in the normal order, this is a good tradeoff. There were a couple strange things about the ROM: some addresses appeared to be missing and some addresses perform sort of a "wild card" match, but I'll ignore that for now. Also, the two ROMs were similar but not quite identical. 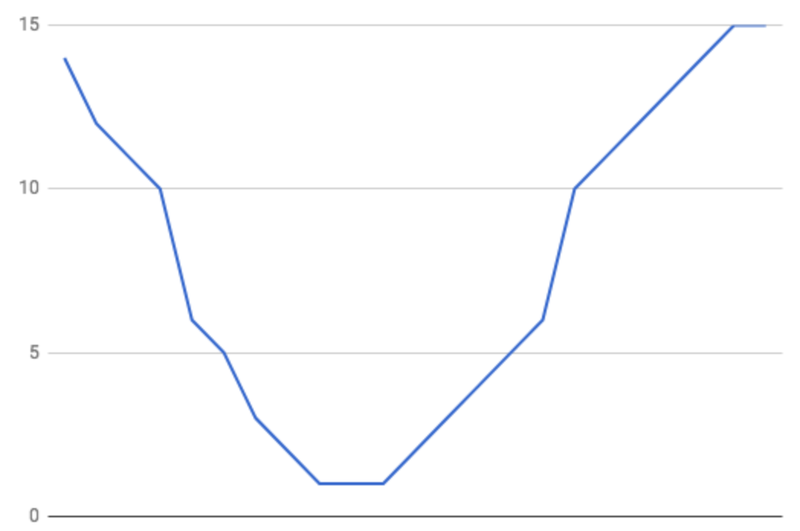 Looking at the data in the ROM, I noticed the rightmost bit was present for a while, then absent, and finally present again, while the other bits jumped around. That suggested the rightmost bit was the high-order bit. 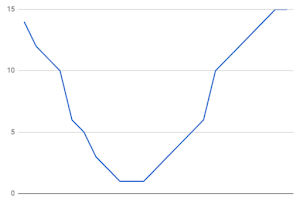 I extracted the data, and after swapping a couple bits got the curve below, a somewhat distorted sine wave. So, the mystery chip had two ROMs with sine-ish curves and two digital-to-analog converters. Clearly it's not a RAM chip, but what is it? I looked at function/waveform generator chips, but they didn't seem to match. Could it be a sound synthesis chip (like the 76477 or a Yamaha synthesizer chip)? They didn't seem to match the chip's characteristics either. Why would the chip have a bunch of inputs and an output with two sine wave channels? 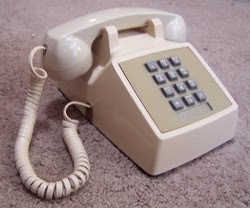 After puzzling for a long time, I thought of Touch-Tone phone dialing. A Touch-Tone telephone. Photo courtesy of Retero00064. A quick web search found a Touch-Tone chip datasheet. The pinout of this chip matched the die photo with the power, input and output pins in the right places. 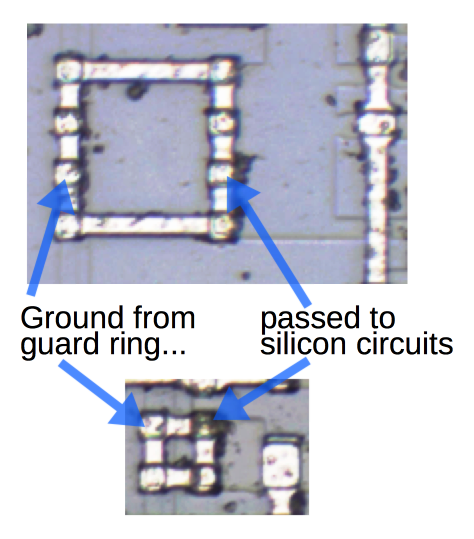 The datasheet said the chip was metal-gate CMOS (not TTL), which matched the appearance of the die. Finally, the datasheet's block diagram matched the functional blocks I could see on the chip. Package of the counterfeit memory chip, labeled 74LS189. Courtesy of Robert Barauch. 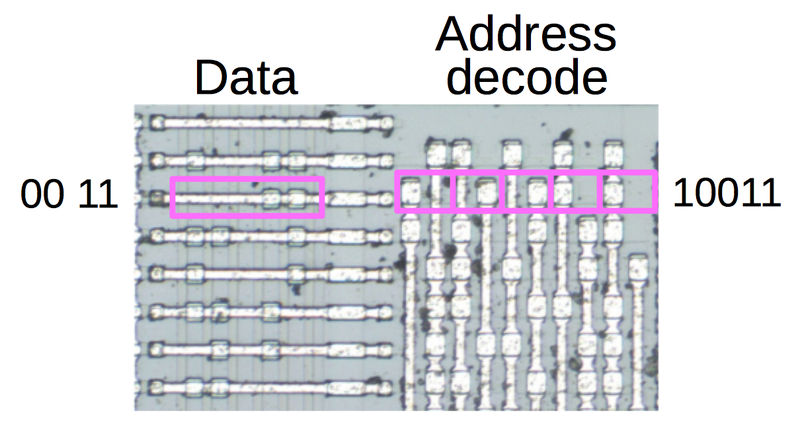 This was pretty conclusive: the mystery die was not a RAM chip but an entirely unrelated DTMF dialing chip. 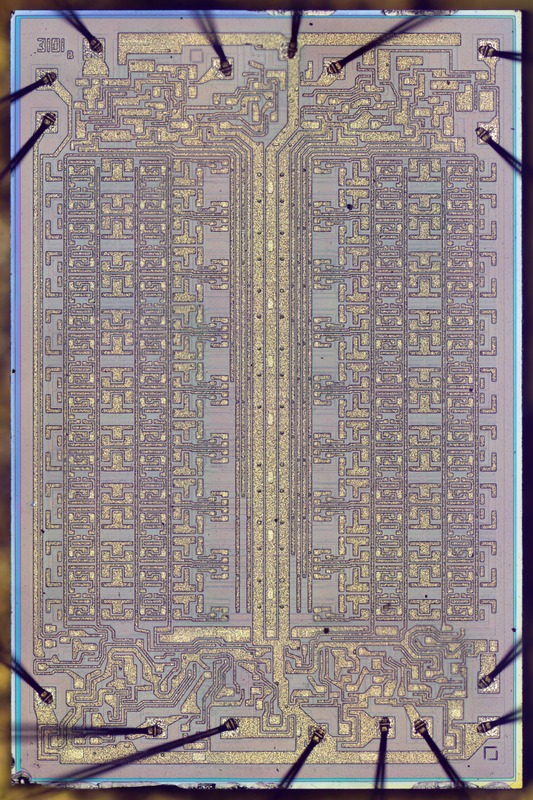 This 74LS189 chip was counterfeit; someone had relabeled the DTMF die as a Texas Instruments 74LS189 chip. Now that I had identified the chip, I wanted to understand more about how it works. It turns out that it uses some interesting mathematics and circuitry to generate the tones. The chip needs to generate two tones of the right frequencies based on the 4 row inputs and 4 column inputs from the keypad. It generates these tones by starting with a 3.579545 MHz11 frequency and dividing it down to two lower frequency clocks. Each clock is used to step through the sine-wave lookup table in ROM, generating a sine wave of the desired frequency. Finally, the two sine waves are combined to produce the output. By looking at the output frequencies listed in the datasheet, we can deduce what is happening internally. For instance, to generate the 1639.0 Hz tone, you can divide the 3.579545 MHz input by 2184. (Reducing a frequency by an integer factor is straightforward in hardware: count the input pulses and reset every time you reach 2184.) Similarly, the other output frequencies can be generated by dividing by integers 2408, 2688, 2968, 3808 4200, 4648 and 5152. Dividing by numbers this large would require inconveniently large counters, but but I noticed these numbers are are all divisible by 56, yielding quotients 39, 43, 48, 53, 68, 75, 83 and 92. These smaller numbers are much more practical to divide by in hardware. This suggests a straightforward hardware implementation: divide the 3.579545 MHz clock by 2. Then divide by 68, 75, 83 or 92 (depending on the row input), using a 7-bit counter. Finally, iterate through a 28-word ROM to generate the sine wave, yielding the 28-step sine wave described in the datasheet. Similarly, the column frequencies can be generated by dividing by 39, 43, 48 or 53 (using a 6-bit counter) depending on the column input. At this point, I had reverse-engineered how the chip operated. Or had I? A closer look at the chip revealed 5-bit and 6-bit counters, one bit too small for the necessary divisors. What was going on? How could the chip divide by 68 with a 6-bit counter? The diagram below shows divider circuitry for the row output, showing the 6-bit shift-register counter. Also visible is the circuit to detect when the counter should be reset, based on which of the four keypad rows is selected.7 The column circuitry is similar, but with a 5-bit counter. Divider circuitry for the row signal, on the lower right of the die. The input frequency is divided by a particular value depending on which of the four keyboard rows is selected. The counter is implemented with a shift register. The LFSR logic generates the new bit shifted in. The count end check circuitry controls the count length for the selected row. The single button check verifies that exactly one button is pressed. I reverse-engineered parts of the chip by closely examining the silicon circuits, so I'll explain some of the silicon-level structures. 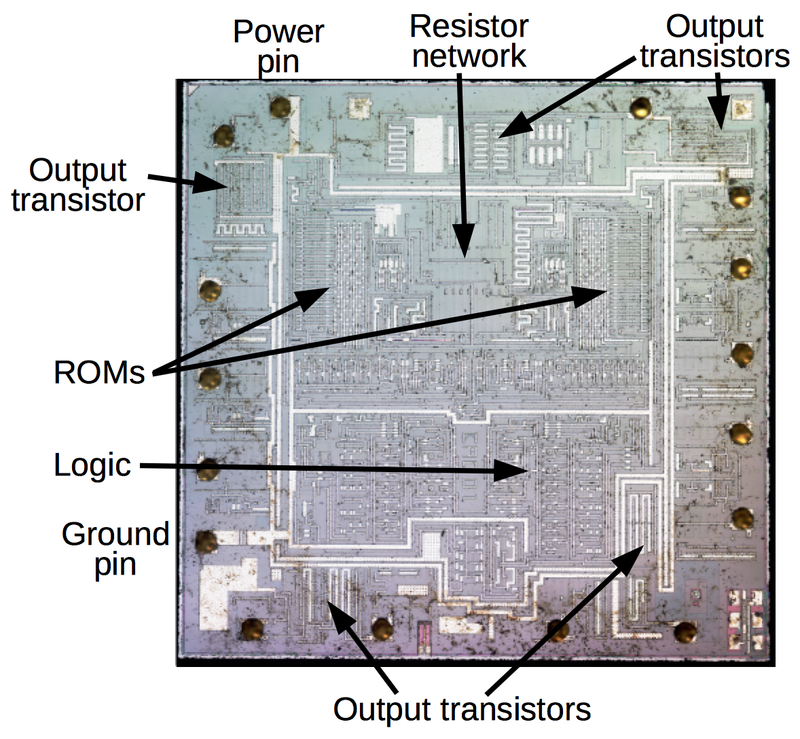 The chip is built mostly from CMOS13, but the structures are a bit more complex than you see in textbooks. The basic idea of CMOS is it is built from MOS transistors, both PMOS and NMOS transistors connected in a Complementary way (thus the name CMOS). To oversimplify, an NMOS transistor turns on when the input is high, and can pull the output low. A PMOS transistor is opposite; it turns on when the input is low, and can pull the output high. 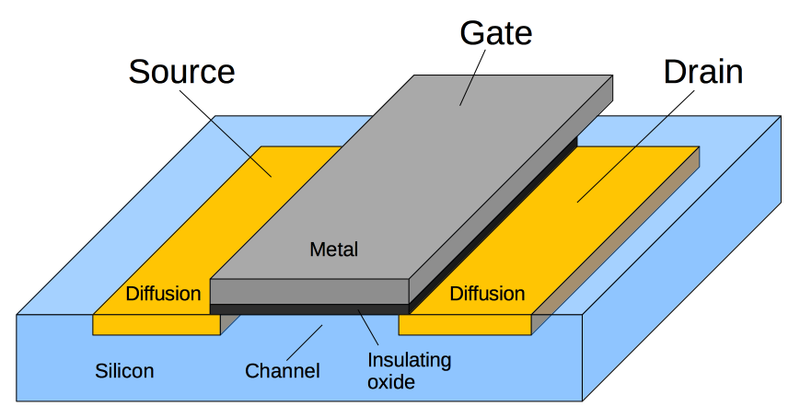 The diagram below shows the structure of a metal-gate MOS transistor. Electricity flows between the source and the drain, under control of the gate. 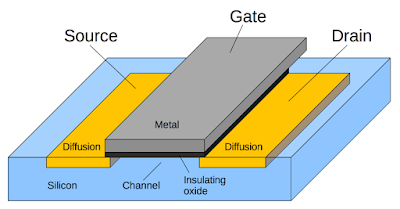 The metal gate is separated from the silicon by an insulating oxide layer. (The Metal / Oxide / Silicon layers give it the name MOS.) 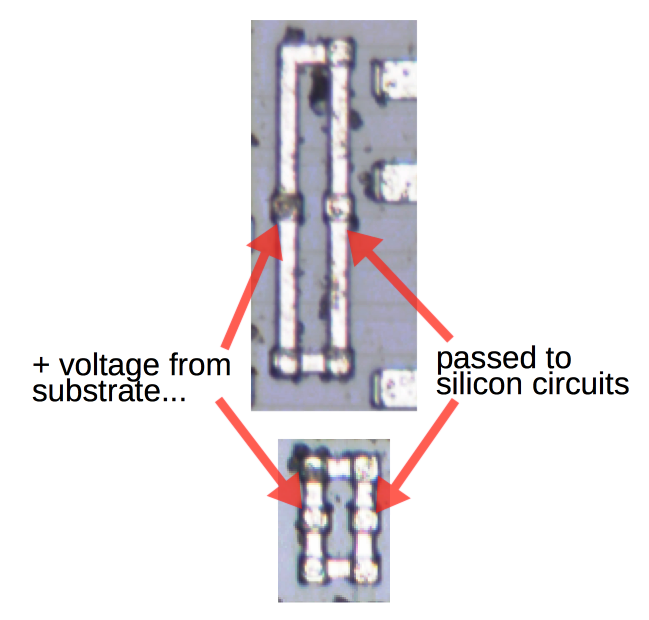 For a PMOS transistor, the source and drain are P-type silicon while the base silicon is N-type. 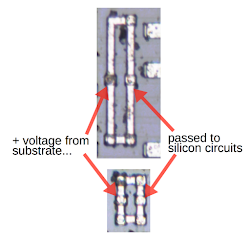 An NMOS transistor is opposite: the source and drain are N-type silicon while the base silicon is P-type. The diagram below shows a CMOS inverter on the chip, built from a PMOS transistor and an NMOS transistor. The first photo shows the metal layer. By dissolving the metal in acid, the silicon is revealed in the second photo. In combination, they reveal the inverter's structure, as shown in the cross-section diagram. You can see the metal gates for the PMOS and NMOS transistors, as well as the silicon regions for the source and drain.12 The black spots are contacts between the metal and silicon, where they are connected. A CMOS inverter is built from a PMOS transistor and an NMOS transistor. 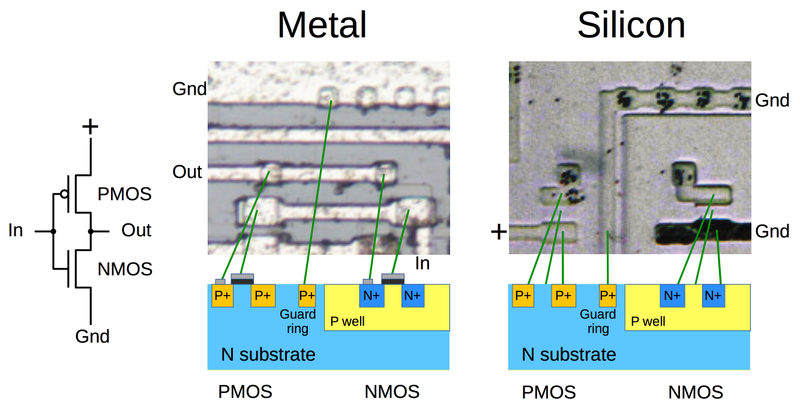 Note that the NMOS transistor must be embedded in P-type silicon. To achieve this, the transistor is placed in a "P well", a region of P-doped silicon. A grounded "guard ring" surrounds the P well to help isolate it. 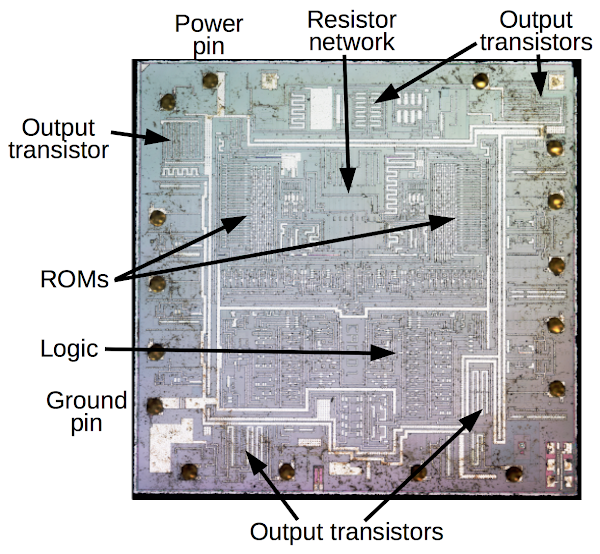 The chip contains multiple P wells, which typically hold multiple NMOS transistors. Logic gates (NAND, NOR) are constructed by combining multiple transistors in a similar way (details). CMOS transistors can also be configured to pass or block a signal (details), a technique used to build the shift registers in the chip. These circuits are straightforward to recognize if you examine the chip closely, allowing the circuitry to be reverse engineered, for example the shift-register counter shown earlier. The DMTF chip is both digital and analog. The diagram below shows the 4-bit digital-to-analog converter for the column tone. (This circuit is in the upper-left of the die; the similar row tone circuit is in the upper right.) The circuit takes 4 bits from the ROM, passes them through a buffer, and then four transistors drive the R-2R resistor ladder digital-to-analog converter that was discussed earlier. The resulting analog voltage forms the synthesized sine wave. Note that the transistors are scaled to provide the necessary current; the "8x" transistor is eight times the size of the "1x" transistor. The NMOS transistors are in a P-well, as described earlier. This circuit on the DMTF chip converts a 4-bit digital value from the ROM into an analog voltage. The die has some unusual structures, metal squares and larger loops that at first glance don't seem connected to anything. I've never seen these described before, so I'll explain what they are. They provide power and ground to parts of the circuit without direct wiring to the power or ground pins. Integrated circuits typically have extensive wiring in the metal layer to provide power and ground to all the circuits that need them. This chip, however, eliminates some of this wiring by using the substrate as a power connection and using the guard rings as ground connections. The photo below shows metal loops that provides a bridge between the positive substrate and a circuit that requires positive voltage. Metal loops are used to get positive voltage (Vcc) from the substrate and feed it to circuits that need it. The metal loops below provide a bridge between the negative guard ring and the circuitry that requires ground. As far as I can tell, there's no reason to make these links a loop rather than a straight connection. 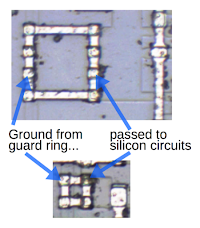 Metal loops connect the guard ring (at ground potential) to circuits that need a ground connection. The chip turned out to be a Touch-Tone DTMF dialer, most likely a knockoff MK5089, repackaged as a 74LS189 RAM chip. Why would someone go to the effort of creating counterfeit memory chips that couldn't possibly work? The 74LS189 is a fairly obscure part, so I wouldn't have expected counterfeiting it to be worth the effort. The chips sell for about a dollar on eBay, so there's not a huge profit opportunity. However, IC counterfeiting is a widespread problem14. For instance, 15% of replacement semiconductors purchased by the Pentagon are estimated to be counterfeit. 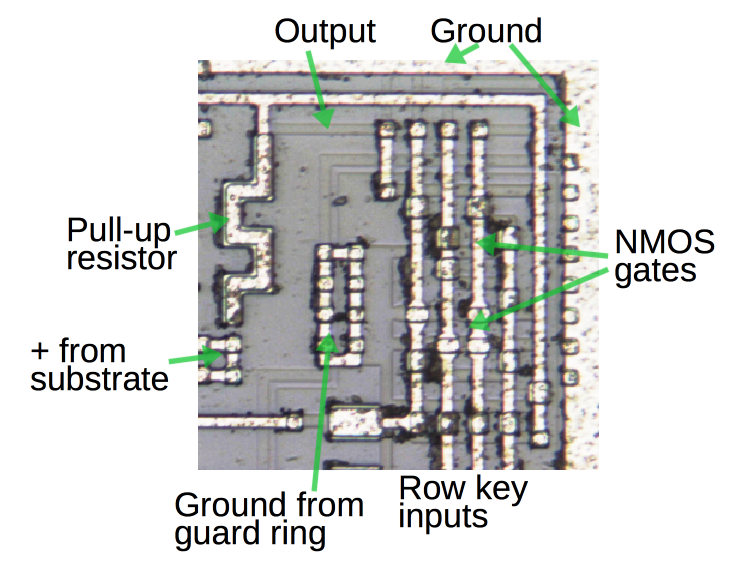 With counterfeiting this widespread, even an obscure chip like the 74LS189 can be a target. Thanks to Robert Baruch for the die photos. His high-resolution photos are here and here. Each DTMF chip's datasheet lists slightly different output frequencies. By factoring these frequencies, I could reverse-engineer the internal design of the chip—the divisors it used and the ROM sizes. The table below gives these values for four different chip designs. Each output frequency is generated by dividing the crystal frequency (3.579545 MHz) by the scale factor, the appropriate divisor, and the points per cycle. Note that the output frequencies are all close to the correct frequencies, but not an exact match. 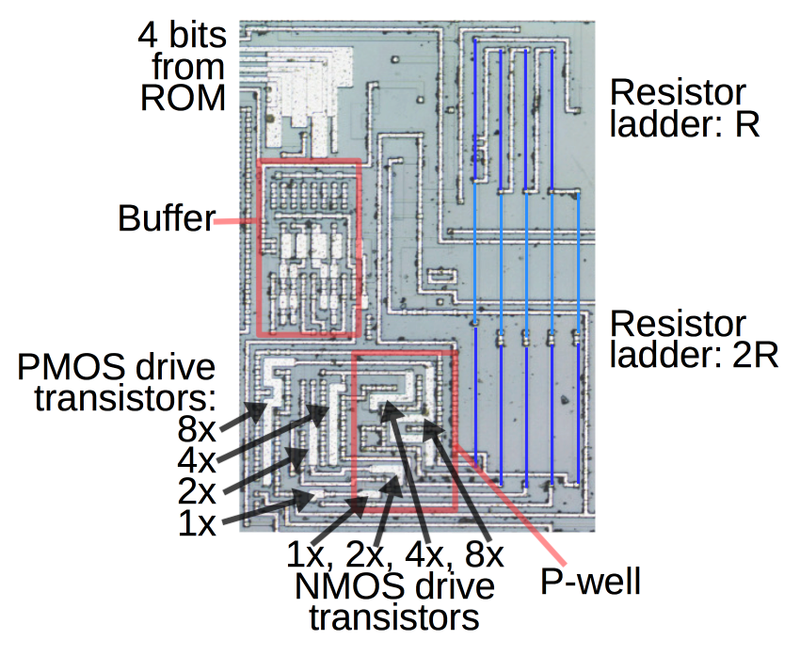 The circuitry to detect multiple button presses is built from NMOS, not CMOS. Why does a shift register take smaller space than a counter? A counter -regardless whether it is synchronous or asynchronous - needs N D-flip-flops, just as a shift register. It is unfortunate to say the two tones were mixed together, since mixing is already a terminus technicus. In the case of DTMF we just add or superimpose them. In the transistor cross-section, the guard-ring connected to ground should be in the p-well, since this sets its voltage. It still helps in isolation since the p-well is connected to a low-ohmic (~ideal) ground. Though it does not isolates from latchup. Double guard rings would be needed for that. The first series of CMOS chips were well-known prune to latch-up. tzg6sa: thanks for your detailed comments. The shift register is smaller than a counter because it is dynamic, built with pass transistors. Each stage consists of two inverters and two pass-transistor pairs. On the other hand, each D flip flop for a counter will typically require 6 gates. I don't understand your objection to "mixing", as that's the word for combining audio signals. Your comment that the guard ring should be in the p-well makes sense and would explain a lot. Looking at the die photo, though, there's clearly a well with a ring outside it. Unless there's some invisible doping (which I can't rule out), I can't get the photo to match up with the ring inside the well. I'm not too happy with my explanation of the guard ring, so hopefully you're right on this. I call the shifter register unit you described as latch. It has a transparent and a latched state, which is chosen by the control input. A D-flip-flop is essentially two latches after each other with different control input. If the shift register is built from such latches than it needs some tricky sequential transparency control (only one bitcell is transparent) for their control input to avoid making consecutive latches transparent at the same time. That's why DFFs are used in LFSRs as well. It solves this timing issue in a simple and elegant way. Do you or maybe Robert have a schematic for the chip? (I have not found it on the project website) I would like to look at this, because it sounds like an interesting trick, if it works. I see now why you used the word mixing. It is used when you add sounds together. In my background which is electrical engineering mixing two sinusoids always meant frequency translation. Since you do not have sounds, but just two bare sinusoids, I think that mixing might not be the best word there. The guard ring should use the same highly doped p+ diffusion what is used in the pmos source/drain. It will ensure a good contact between the metal and the well. There is no need to add one more technology step. So if you see anything more than the edge of the p-well and a diffusion next to the edge, then something tricky is going on there. Hi Zoltan! If you connect the two inverters in a loop, this will make the latch you describe. But in the shift register they are all connected linearly. A two-phase clock controls the pass transistors so there's no transparency. 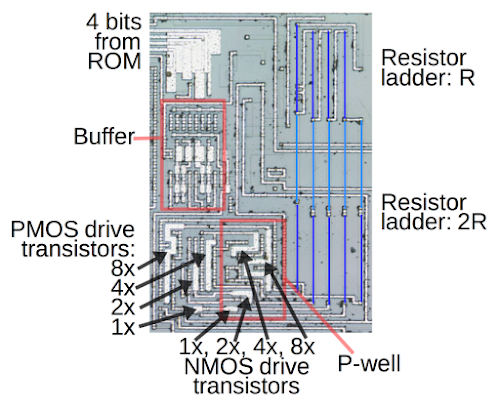 There's a more detailed explanation of the dynamic shift register here (although NMOS not CMOS). I've sketched out parts of the chip but haven't made a schematic since it would be time-consuming. I've described in the article the parts I thought were most interesting; most of the rest is pretty much what you'd expect based on the block diagram. Here's a link to the die photo of one of the P-wells. The well continues downward; I cropped it. The "outside" of the photo is the N region. You can see the narrow guard ring; the black spots on the top sides are connections to the ground metal. Inside the guard ring is the P-well, with various transistors inside it. Outside-in, you see N-silicon, guard ring, small gap, P-well. If the guard ring is inside the P-well, then I'm not sure what the small gap would be. Why do you think the 74LS189 was being counterfeited? It was the touch tone chip being counterfeited, and disguised as a 74LS189. The buyer knew the ruse. This is an amazing article/observation you published. Yes, this was a very interesting article. I am not an engineer, but my reading comprehension is excellent. I was fascinated by the effort it took to create the fake, and by the effort the writer put into reverse-engineering and documenting his findings. I still wonder if this chip had another application unknown to us. Every time a military plane crashes (or a Navy ship is rammed in Asia), I wonder about those counterfeit chips floating around in inventory. Excellent. what king of equipment is needed to take such photos? xray? Nerd Progre: These photos were taken by Robert Baruch with a metallurgical microscope. It's like a normal microscope except the light shines down through the lens, rather than from underneath. I wrote an article explaining how I take a bunch of photos and then stitch them together into a high-resolution die image. This really makes me wonder about what chips are stuck inside devices that we buy that are really 'sleeper' circuuts designed to do mischievous things. But these old chipsets, but in today's devices where data has become so essential. I wonder if they could be used to siphon data off?? I'm just wondering, did TI ever make the DTMFchip, possibly for someone else and the chip is just an original mislabeled chip? Or is there no explanation other than it being counterfit on purpose? regarding the [email protected] auctions of fake chips from china. Wondering if anyone else saw this. That the cause of the fake parts, which has been a hot topic for many years, is the result of the mistaken identification of components. Since the wearing and fading of the ink of the part# results from 35+yr old parts while sitting in hot warehouses, and also from just cleaning the parts. Most of the parts are marked correctly,and they apparently used fake datecodes to distinguish the re-stamped parts. Presumably they acquired all of these computers from the sales during liquidation or simply just e-waste shipped overseas. Some of the part suppliers in the article, who buy these parts by the thousands directly from these sellers iso [email protected], vouch for theses sources. I remember playing with TTL logic back when I was a kid in the 70's. I built a Nixie tube counter from a schematic using a 7490 decade counter, 7475 latch and 7441 BCD to decimal Nixie driver. I remember the 7489 IC's were quite expensive then and I see they still command a premium for a 40+ year old technology. As for the color burst crystals, it is amazing how many devices still use the 3.579MHz frequency. NTSC has been dead eight years now but that frequency standard will probably live on even longer than NTSC color did! The photomicrographs were taken using incident light, yes, probably using Differential Interference Contrast as a lighting technique. The Reichert 2560 is one of the microscopes used to get images of on-chip circuitry. I have one, and love it. The author posited, "Why would someone go to the effort of creating counterfeit memory chips that couldn't possibly work? The 74LS189 is a fairly obscure part, so I wouldn't have expected counterfeiting it to be worth the effort. " I would think the most logical explanation for this chip was not that someone went through the trouble of trying to pass off one chip for another, but rather that the manufacturing process simply put the wrong label on the chip. That would seem to me way more plausible than some kind of intentional subterfuge for a low demand chip in the first place. I was thinking pretty much the same thing. A cursory Google search shows no real price difference between an MK5089 and a 74LS189. Unless someone got a fantastic deal on MK5089's for a few pennies each, the effort to change the labeling seems hardly worth it. As I noted in my post above, I recall back in the 70's the older 7489 64-bit RAM was expensive even then and now the 7489/74189 chips are still a bit more expensive then most other members of the 74xx family (price exceptions like the 7441/74141 still exist of course). I see even the old 7447 BCD to 7 segment decoder is quite cheap now. I recall it took two months allowance to buy the 7490, 7475 and 7441 chips along with other parts at Radio Shack. I really enjoy your reading your blog. The clarity of images and explanations you do are Excellent. Brings back memories of dtl, pmos, nmos, cml, LPS logic and so on. I worked at Ti in the early 80's in test engineering. I did not work on this particular family though. A couple of comments. - I occasionally saw chips that were incorrectly labeled by our own assembly, but only our own chips. - I also saw chips that were incorrectly labelled by contract assembly. - These were other manufacturers chips in the exact same package as ours and symbolized with the TI logo etc.. but obviously they failed final testing. We would use xray and or decap the parts to figure out what was going on. Then ship them back.. I cant speak for TI but struggle to see how this sort of stuff would be shipped by TI. We would always test after completion of symbolization and obviously no way would these have passed. They would have been scrapped. Any scrap wafers, die or package parts were pulverized to dust and went into a recycle process. Even contract assembly had to return all unused and/or red ink die back to us for the same recycling. I suspect a counterfeit operation. even if the two parts have equivalent market prices, the volume demand for the DTMF chip is miniscule compared to the TTL logic part. If you bought a pile of DTMF chips and couldn't sell them, the equivalent price is illusory. Change them to something that will move and money is generated. I'm impressed the the attention to detail and knowledge required to do this reverse engineering! As an embedded engineer who uses ICs all the time but doesn't really understand how the internals work (or the history behind them), this was very insightful. Thank you! Excellent work. The clarity of explanations and detail provided is much appreciated.